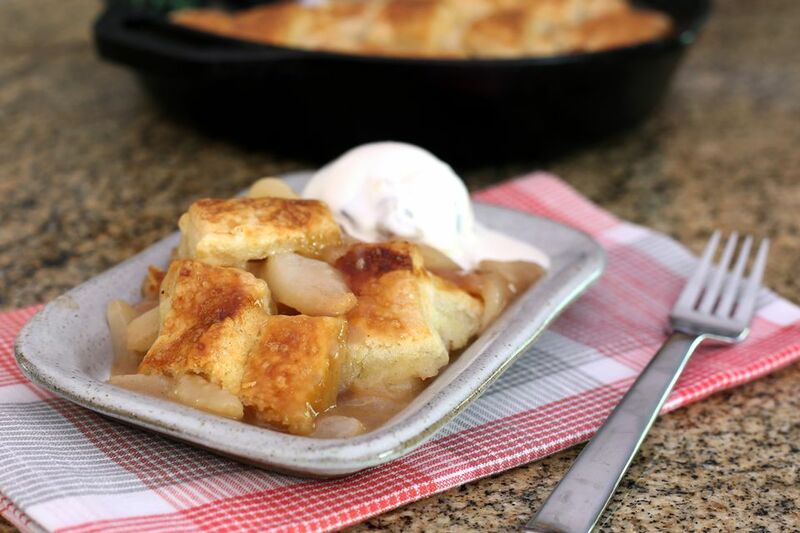 This scrumptious pear pandowdy is a cross between a pie and a cobbler, and it's a fabulous choice for fall baking. The pieces of pie dough are cut into squares and placed over the pear filling. It's much easier than pie because there's less fuss with the crust. The dough is a snap to make in the food processor, and there's no need to make perfect circles. Just chill the dough, roll it, cut it out, and then freeze the squares until you're ready to bake. You could easily make the dough a day or two in advance. A pandowdy is typically made with apples. This pear version is a testament to its versatility. Sliced apples or half apples may be used in this dessert, or make it with the addition of some fresh late season raspberries or blackberries. The whimsical name of the dessert, "pandowdy," is thought to reference its "dowdy," or inelegant appearance. And that's what makes it so easy! Bosc and Anjou pears are excellent for baking because they hold up well. Bartlett pears can be used in the filling as well. Choose firm pears for the recipe. In a food processor, combine the 1 cup of flour, the granulated sugar, baking powder, and salt. Pulse to combine thoroughly. Cut 10 tablespoons of cold butter into small pieces. Gradually add the butter pieces to the flour mixture, pulsing briefly after each addition. Pulse just until many of the crumbs are about the size of peas. Drizzle the ice water into the food processor while pulsing. When the mixture begins to clump together, transfer it to a floured surface. Knead a few times to form a cohesive dough. Flatten the dough into a disk and wrap in plastic wrap. Refrigerate for at least 45 minutes. Remove the dough to a floured surface and roll it out into a large square about 1/4-inch in thickness. With a pizza cutter or knife, cut it into squares, rectangles, or other shapes. Place the dough pieces on the lined baking pan and place the pan in the freezer. Peel a pear and slice in half lengthwise. With a melon baller, remove the core and cut out the stem and blossom end; remove any tough fibers. Place a pear half on a cutting board, cut-side down. Slice it into 1/4-inch wedges. Toss the wedges in a large bowl with the 1 tablespoon of lemon juice. Peel, core, and slice the remaining pears and add them to the bowl. Add the vanilla and toss to combine. In another bowl, combine the brown sugar, cinnamon, nutmeg, and the remaining 3 tablespoons of flour. Mix well. Sprinkle the brown sugar mixture over the pears while tossing to coat thoroughly. Put the pears in a 10-inch cast iron skillet. Cut the remaining tablespoon of butter into small pieces and scatter them over the pear filling. Drizzle with syrup or molasses, if using. Remove the dough pieces from the freezer and arrange them over the pear filling. Overlap them as needed. Combine the egg white and water and whisk to make the egg wash. Brush the egg wash mixture lightly over the pieces of dough. Sprinkle with sanding sugar, if desired. Bake in the preheated oven for 45 to 55 minutes, or until the topping is golden brown and the pears are tender. *Use maple syrup, sorghum syrup, molasses, or golden syrup.